A federal prosecutor says Raymond Lee Fryberg Jr. “slipped under the screen” when he purchased firearms despite a court order barring him from gun ownership. One of the weapons was used in the shootings at Marysville-Pilchuck High School. Raymond Lee Fryberg Jr. “slipped under the screen” when he was allowed to purchase firearms despite a tribal court order barring him from possessing the weapons, assistant U.S. Attorney Bruce Miyake said Tuesday during opening statements in Fryberg’s federal trial. On government forms, Fryberg repeatedly stated that he wasn’t the subject of a protection order, despite pleading no contest to violating the 2002 order in 2012, Miyake said. Defense attorney John Henry Browne countered by saying the now-deceased tribal police officer who said he served Fryberg with the paperwork was the brother of Fryberg’s ex-girlfriend, who had sought the protection order. Additionally, the street intersection where the order was supposedly served “does not exist,” Browne told jurors. Fryberg, 42, a Tulalip tribal member, underwent a thorough background check when he applied for a concealed-weapons permit in early 2013. That check came back clear, along with at least a dozen other government checks, Browne said. Fryberg is charged with six counts of unlawful possession of a firearm, including the .40-caliber Beretta pistol his son, Jaylen Fryberg, used in the cafeteria at Marysville-Pilchuck High School in October to kill four classmatesbefore turning the gun on himself. U.S. District Court Judge James Robart has taken pains to insulate the jury from references to the school shooting, telling the jury of eight women and six men that the case is solely about whether Raymond Fryberg illegally possessed the weapons. The investigation into Fryberg’s gun ownership began in October 2014 when “the FBI was trying to determine ownership of a firearm that had come into their possession,” Miyake told jurors, avoiding any mention of the school shooting. The FBI searched Fryberg’s house and found five firearms “left unsecure, out in the open, at the foot of his bed,” Miyake said, adding additional weapons purchased by Fryberg were turned in by Fryberg’s sister. Miyake said Fryberg told an FBI agent that he’d been served “back in 2002” with the protection order but decided not to fight it. He told the same agent he “didn’t really pay attention” to questions on forms he filled out before purchasing weapons in 2013 and 2014, Miyake said. To meet part of its burden of proof, the government must convince jurors Fryberg received notice and had a chance to participate in a hearing before a permanent protection order was issued — which the defense claims never happened. According to prosecutors, Fryberg was the subject of a permanent Tulalip Tribal Court domestic-violence restraining order when he purchased the Beretta handgun in January 2013 from a Cabela’s sporting-goods store on the reservation. Prosecutors say Fryberg repeatedly lied on the instant background-check form when he bought the handgun and a number of rifles from Cabela’s. The background check should have turned up the restraining order, which was issued in 2002 after the senior Fryberg allegedly assaulted his girlfriend. In 2012, Fryberg was found in violation of the order and fined $200 and placed on probation. Prosecutors say Fryberg had been given a copy of the permanent order at that time and knew he was banned from buying guns. However, that restraining order was never entered into the National Crime Information Computer or state databases that are used to check the backgrounds of would-be gun buyers. According to Heather Anderson, section chief of the Washington State Patrol’s Criminal Records Division, participation in the program to build those databases is voluntary, and the Tulalip Tribes were not participating at the time. The tribes are a participant now, she said, and restraining orders out of Tribal Court are entered into the system by the Snohomish County Sheriffs Office and recorded in Superior Court as well. 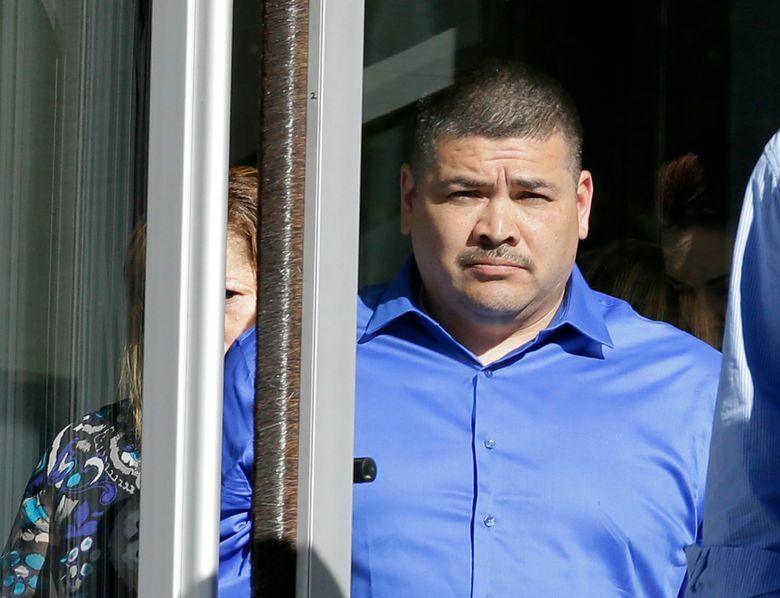 Defense attorneys say the protection order issued by the Tulalip Tribal Court did not indicate Fryberg was barred from possessing firearms, so he was unaware of the ban. Browne, the defense attorney, said Fryberg was issued a concealed-carry permit before the school shootings. Additionally, government agents stopped Fryberg at least three times while he was hunting, ran his name and determined his guns were legal, Browne said. Browne has accused the government of trying to punish his client for the sins of his son. “He had nothing to do with what happened at that high school,” he said shortly after Fryberg was charged in March. Jaylen Fryberg, 15, fatally shot four friends he had invited to lunch and wounded a fifth teen before killing himself. The teens who died were Gia Soriano, Zoe Galasso and Shaylee Chuckulnaskit, all 14, and Andrew Fryberg, 15. All were shot in the head. Nate Hatch, 15, was shot in the jaw and spent about two weeks in a Seattle hospital. Andrew Fryberg and Hatch are Jaylen Fryberg’s cousins.